Much of the world’s Internet management and governance takes place in a corridor extending west from Washington, DC, through northern Virginia toward Washington Dulles International Airport. Much of the United States’ military planning and analysis takes place here as well. At the center of that corridor is Tysons Corner—an unincorporated suburban crossroads once dominated by dairy farms and gravel pits. 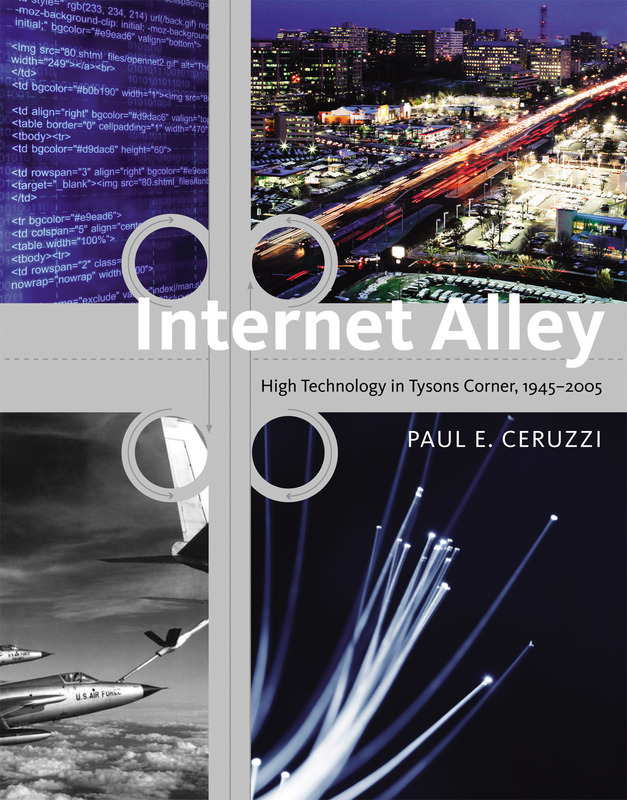 Today, the government contractors and high- tech firms—companies like DynCorp, CACI, Verisign, and SAIC--that now populate this corridor have created an “Internet Alley” off the Washington Beltway. In From Tysons Corner to Internet Alley, Paul Ceruzzi examines this compact area of intense commercial development and describes its transformation into one of the most dynamic and prosperous regions in the country. Ceruzzi explains how a concentration of military contractors carrying out weapons analysis, systems engineering, operations research, and telecommunications combined with suburban growth patterns to drive the region’s development. The dot-com bubble’s burst was offset here, he points out, by the government’s growing national security-related need for information technology. Ceruzzi looks in detail at the nature of the work carried out by these government contractors and how it can be considered truly innovative in terms of both technology and management. Today in Tysons Corner, clusters of sleek new office buildings housing high-technology companies stand out against the suburban landscape, and the upscale Tysons Galleria Mall is neighbor to a government-owned radio tower marked by a sign warning visitors not to photograph or sketch it. Ceruzzi finds that a variety of perennially relevant issues intersect here, making it both a literal and figurative crossroads: federal support of scientific research, the shift of government activities to private contractors, local politics of land use, and the postwar movement from central cities to suburbs. Paul E. Ceruzzi is a Curator at the National Air and Space Museum, Smithsonian Institution, Washington, D.C. He is the author of A History of Modern Computing (second edition, MIT Press, 2003) and other books, and coeditor of The Internet and American Business (MIT Press, 2008).